We are currently NOT traveling to Venezuela! 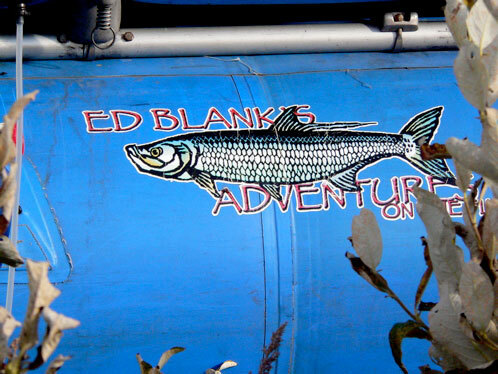 Ed Blank’s Adventures started running Alaska float trips over 20 years ago. 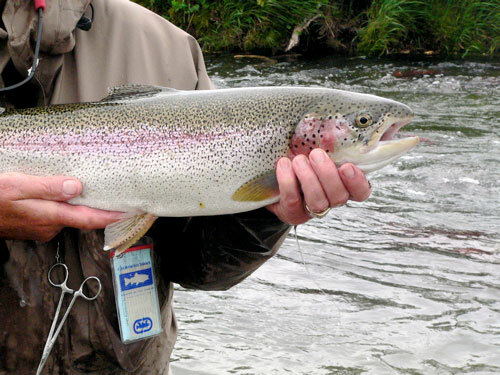 We now help anglers zero in on the right river at the right time of the year and the right outfitter. 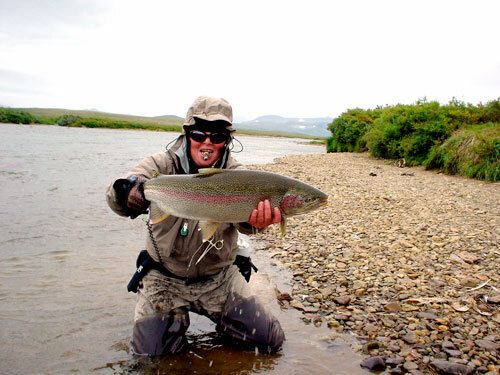 Fly Fishing in Alaska is a vast wilderness of trips some good, some bad and some really ugly. 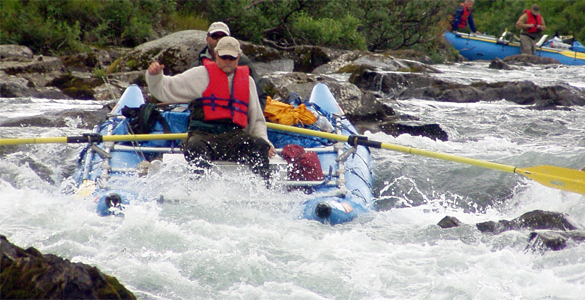 We can help you wade through the rapids! You will be rafting and camping your way down a spectacular river in the Bristol Bay area of Alaska. 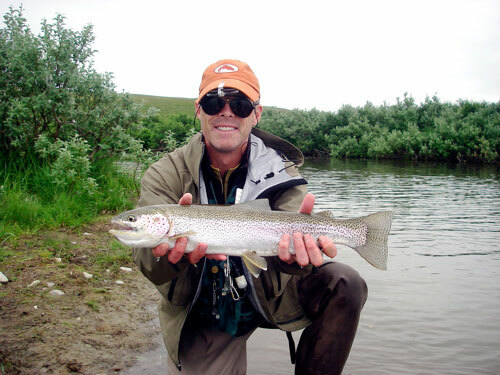 The trips are fly fishing only as some of the rivers we float are fly fishing only by regulation. 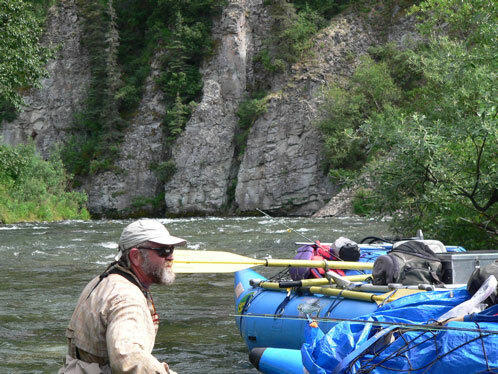 Choosing your float trip outfitter, your guide and the specific river and the time of year is an important, complicated process. We hope that what you read here will give you confidence in our guides, equipment and knowledge of the water. 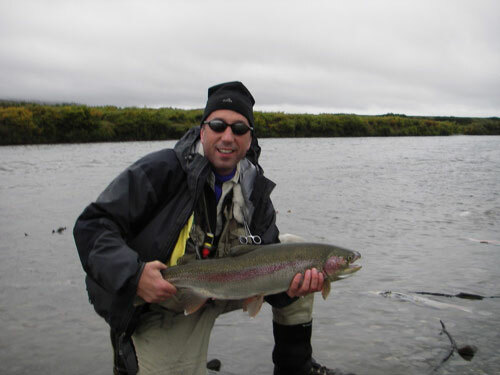 Our trips tend to concentrate on the fly fishing opportunities for rainbow trout and regard salmon fishing as a bonus, but we can also key in on any of the Alaska salmon runs. The rivers we float run clear and are easy to wade. The fish are wild, big and plentiful. The guides are eager to please, and love teaching. 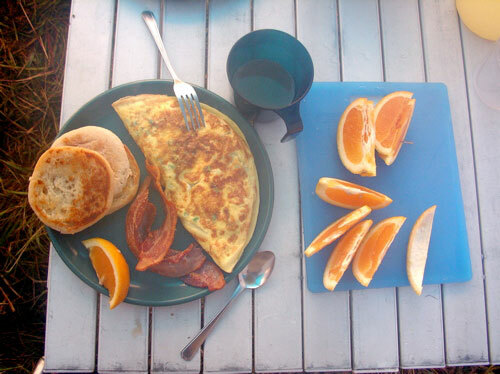 Our equipment is first rate and the food is fresh and plentiful. 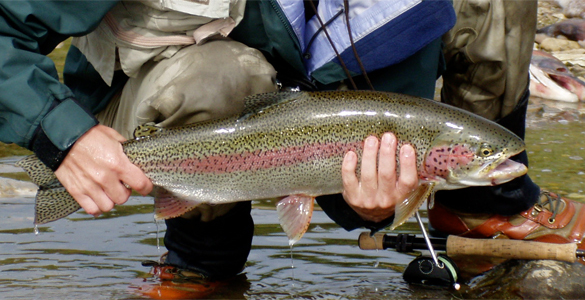 Are you a fly fishing enthusiast looking for large rainbow trout? Maybe, king salmon in front of your camp? 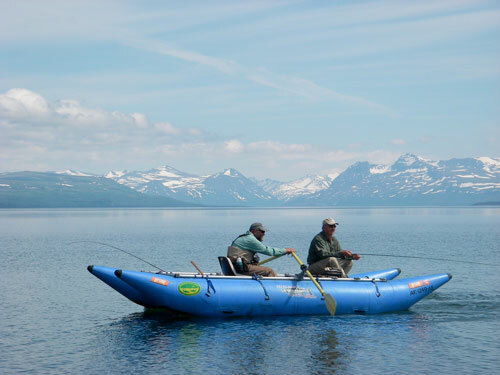 Our Alaska float trips are fly fishing only and offer an exhilarating way to explore the incredible Alaska wilderness known as Katmai National Park. 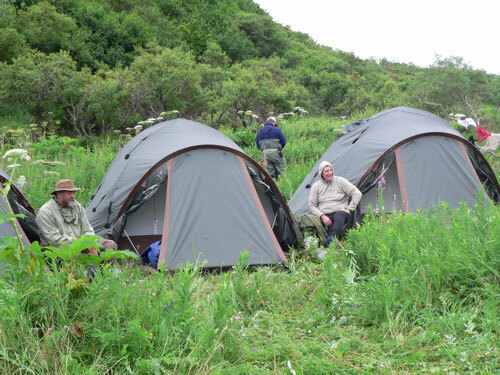 Imagine camping on the bank of a remote stream, fishing until midnight, waking up to the sound of salmon splashing their way upstream or trout slurping caddis outside your tent. 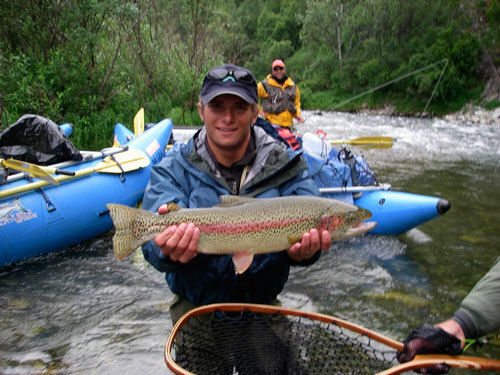 These float trips are for fly fishing enthusiasts whether they be novices or experts in the art of fly fishing. 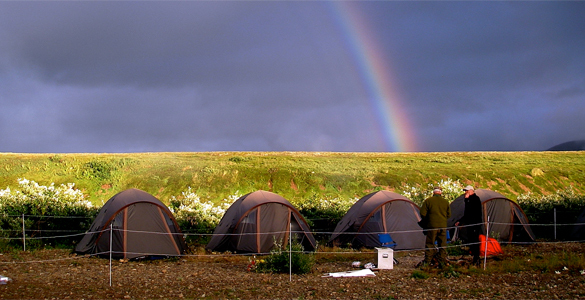 We promise to provide patient, fly fishing instruction and lots of easy to fool rainbow trout, grayling, salmon and char!. 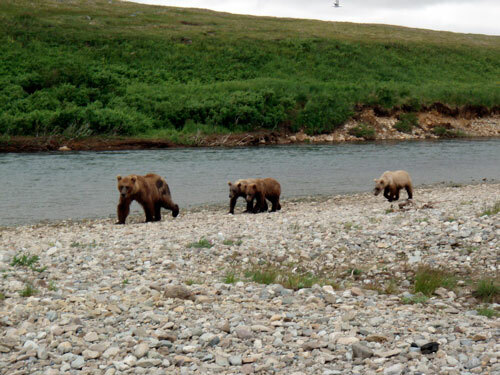 We have several different rivers to float here in Katmai National Park: the Alagnak River, Grizzly Creek, and Moraine Creek. I also work with my friends at Ouzel to provide trips to the Kanektok, Lake Creek, and the Salmon River. 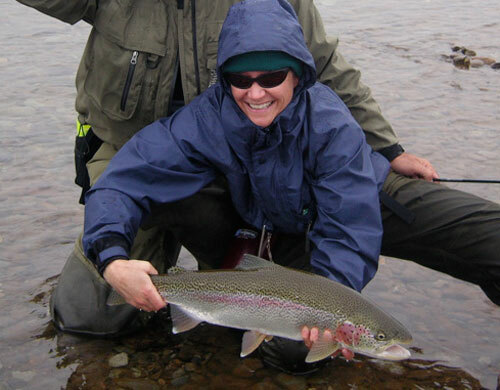 Alaska Rainbow Adventures offers the Goodnews, Aniak and Togiak rivers. 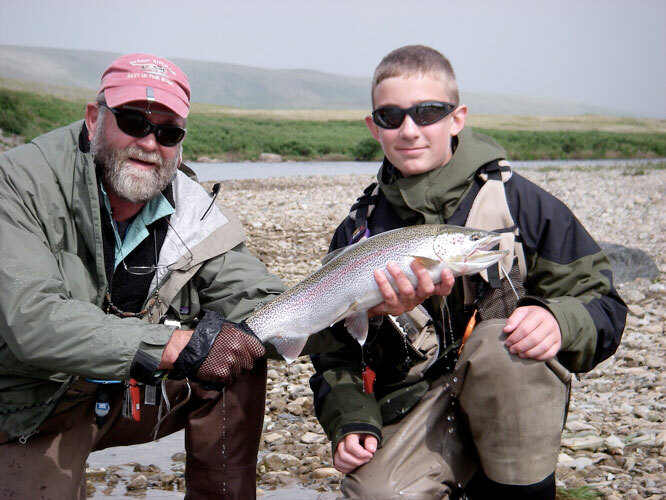 Between us we have been floating and fly fishing these rivers for the last 25 years and have great confidence in our ability to get you a safe successful float trip. These rivers will live up to your expectations. Fly Fishing is all we do, no spin fishing here. I am not a snob, I just don’t know much about spin fishing as I grew up fishing on a fly fishing only river! Some of the rivers we float are fly fishing only. 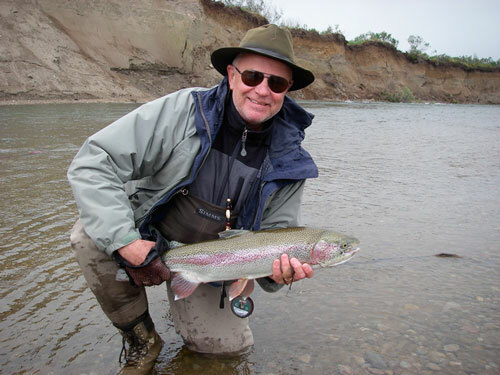 You can spin fish ( artificial lure, barbless single hook) on the Alagnak and other rivers but not the Moraine or the Grizz. Most of the fishing is done while wading and although we do fish from the boats while moving down the river. We stop often for a lot of wade fishing. 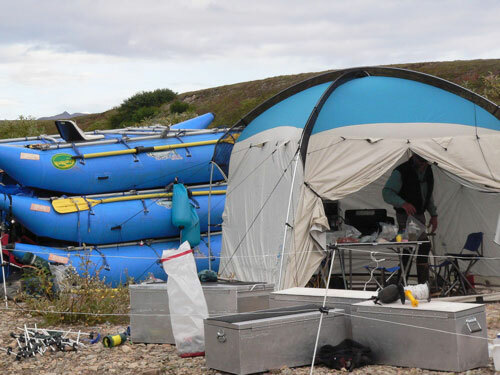 Only a small percentage of time is spent in the rafts. 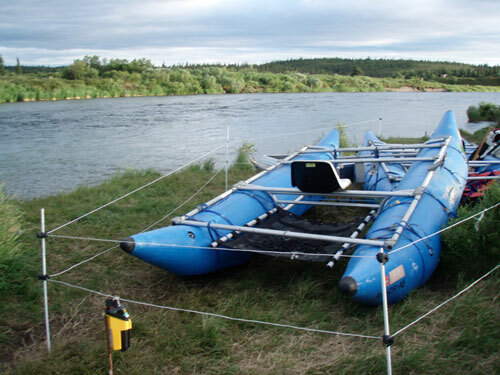 For example, an Alagnak float trip it only takes 12 hours of river rafting to get to our take out, yet it takes us 6 days to fish it, so you can see we wade a lot every day. 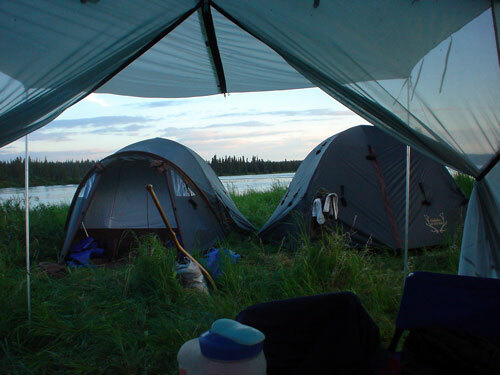 As you probably know a float trip entails camping. You will board a float plane loaded with the rafts, gear and supplies. 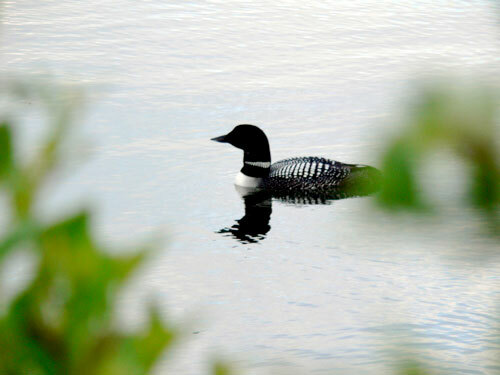 It will be about a 30-60 minute flight to a lake at the head of your chosen river. After that we are on our own in the middle of nowhere! 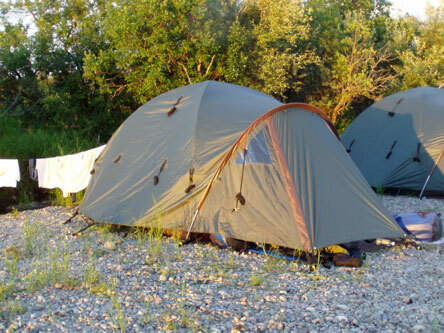 This is comfortable camping since we are not backpacking we can carry lots of gear. 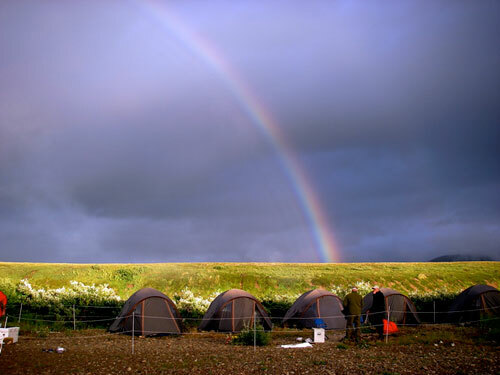 This means cots to sleep on, tents you can stand up in, a screened weather proof dining tent, tables stools and lots of great fresh food and wine that will rival any land based lodge. 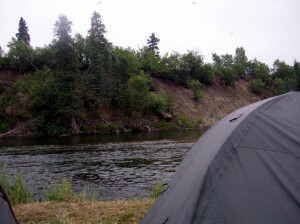 For us, the camping seems a small price to pay to be living on the river with all the extra fly fishing and wild life viewing time that a float trip offers. We have rainbow trout, Grayling, Char, King Salmon, Chum Salmon, Sockeye Salmon, Pink Salmon and Silver Salmon in these waters. 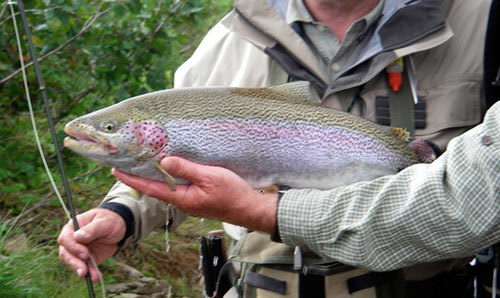 Our favorite quarry however is the rainbow trout and we love to fly fish for them. Some of the rivers we float are fly fishing only by law, but all of our trips are fly fishing only regardless of the regulations on the river. 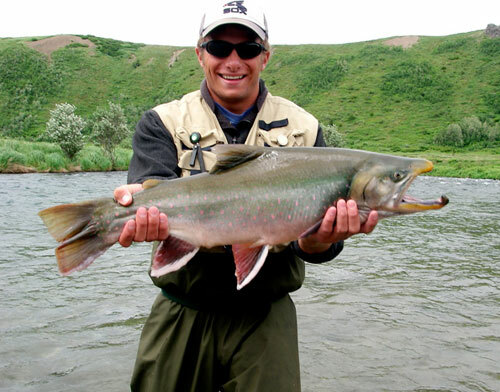 Alaska fly fishing regulations require fishing a single, barbless, hook, and all the fishing is catch and release for trout. 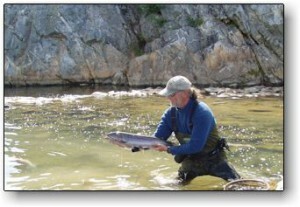 ( We can harvest a salmon or other non trout species for an occasional dinner if you like). 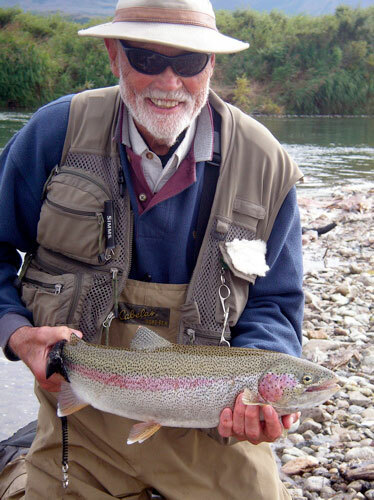 The big rainbows range from 5-12 pounds, and we have landed a couple fish in the 15 pound range ( Moraine Creek) Five species of Pacific Salmon, Char and Grayling add to excitement every day. 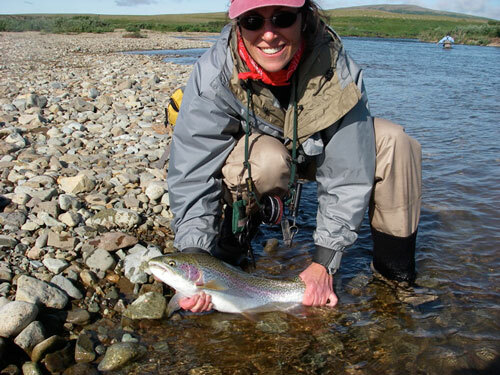 Whether you want to fish dry flies for rainbows, or throw a ten weight for a 60 pound King salmon, we feel we offer the best fly fishing float trips in all of Alaska. 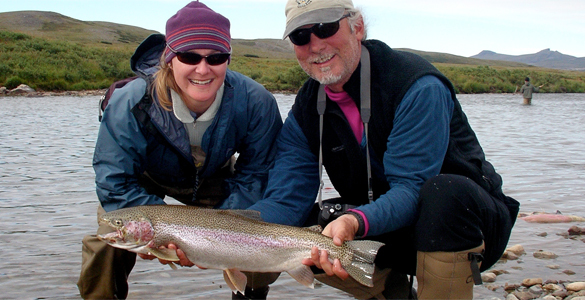 Join us for the float fishing adventure of a lifetime and the finest fly fishing that Alaska has to offer. 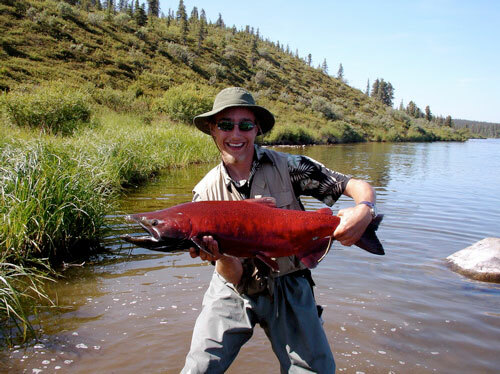 Why travel all the way to Alaska for a float trip?, Then all the way out to King Salmon, or Dillingham Alaska? Then get in a float plane and go even farther? 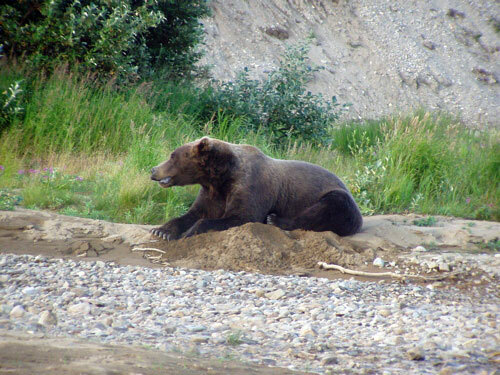 The sad truth about Alaska is that if you can drive to a river that has good fishing it will be elbow to elbow. Hike up that stream for an hour and you will have a few people at each good hole. Take a float plane out of Anchorage and it thins out more, take a commercial flight from Anchorage to King Salmon and there are less people, hop on the float plane from there and we start to get alone. I can’t stress enough how important it is to get yourself away from Anchorage, the last little flight from Anchorage to King Salmon is expensive but so worth it! 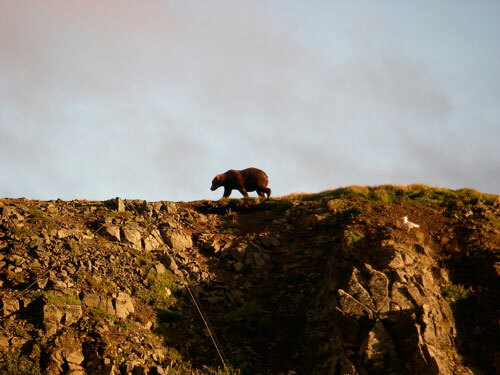 Experience the wilds of Alaska away from the crowds, the way it should be. 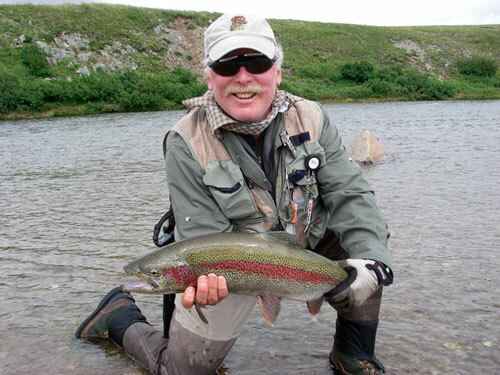 *Ed Blank has been fly fishing for trout since the age of 6 back in the woods of New Hampshire, Since then he has fished throughout the world in search of fly fishing heaven. 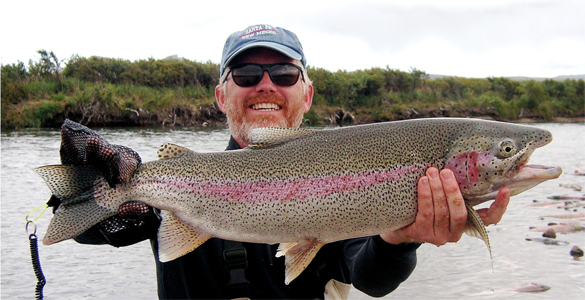 Float trips offer an exhilarating way to explore this incredible fishery. Imagine camping on the bank of a remote stream, fishing until midnight, waking up to the sound of salmon splashing their way upstream. 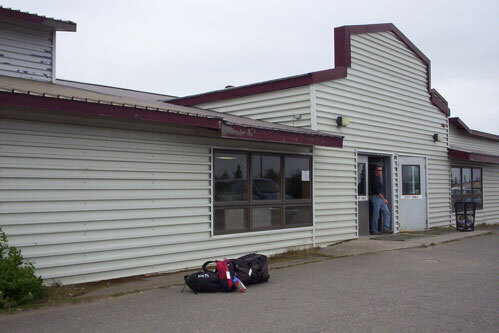 The trip begins with your arrival at the local airport ( Usually King Salmon or Dilingham). 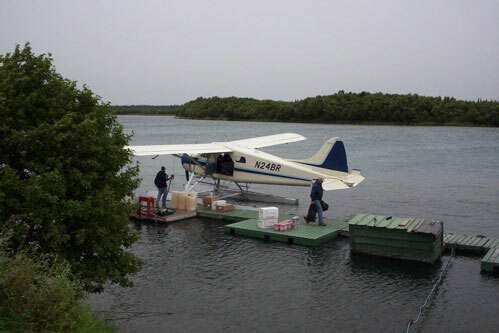 We will double check your provisions and equipment, make sure everyone has a license and head down to the float plane dock. 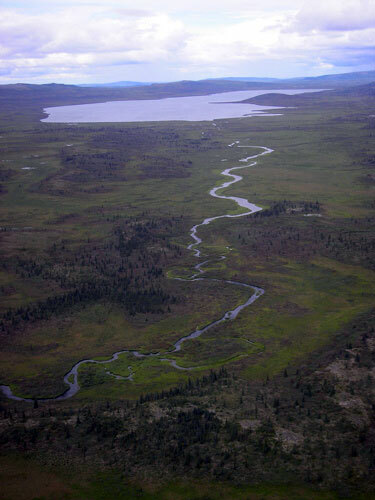 The flight to the lakes takes about an hour over vast areas of tundra, forests and lakes. We land in a spectacular lake at the foot of the mountains and unload all the gear. As the plane takes off we realize how far from civilization we are. 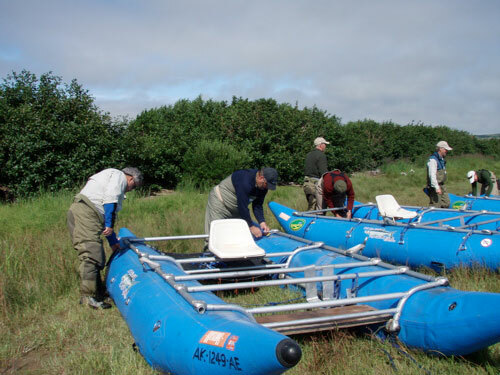 If the fishing is good at the lake we’ll get right to it, if we need to proceed down the river to better fishing we will set up the 16’ inflatable catarafts, load up the gear, set up some fly rods and head down.. It doesn’t take long to get into some exciting fishing! 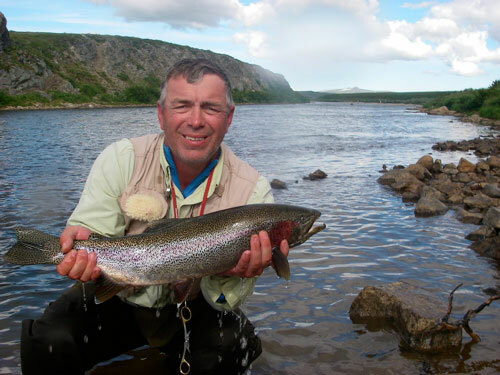 We are in the heart of the best freshwater fly fishing in the world; clearwater streams, huge salmon runs, large predacious rainbow trout and you. Toward evening we need to set up camp and get some dinner. We all share in the tasks of setting camp, doing dishes, loading the boats, etc. 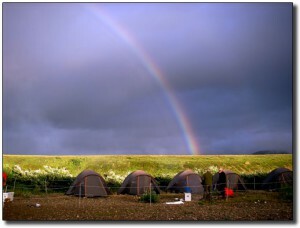 The camp is luxurious by camping standards with oversized tents that you can stand up in, cots to sleep on make a huge difference, and a screened dining tent with table and stools for meals. 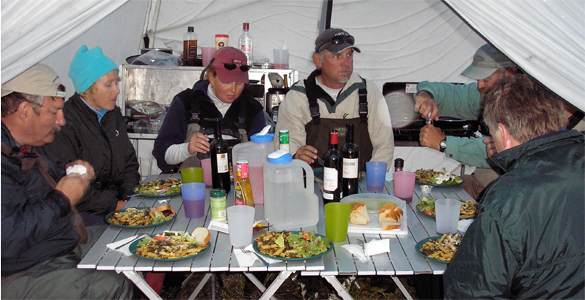 Dinners and breakfasts are fairly elaborate (check out the menu section) and prepared by your guide, lunches usually consist of sandwiches served boat-side while on the river. Fishing until 1 am or starting at 5 am is not unusual because of the long days. 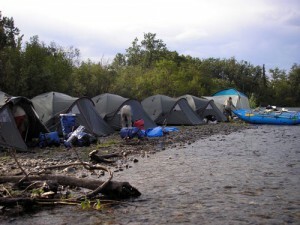 Our trips are also participatory, meaning we all pitch in with the camp chores like: setup and striking of camp; dishwashing; hauling gear from the boats to the camp site; and setting up the rafts. This does 2 things for the group, it keeps our time on the river floating and fishing and it creates a bond between the guides and the guests. 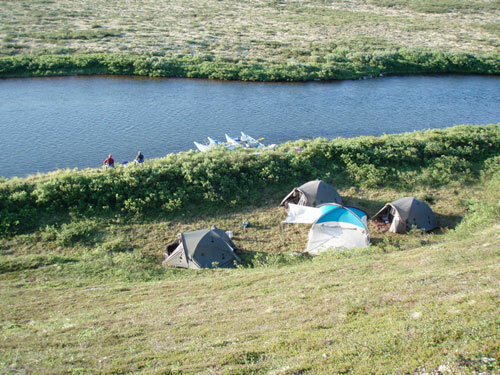 With your help we can set up camp in less than an hour, if it were just the guides it would take 2.5 hours which means we would leave later in the morning and have to rush through some great fishing spots to get to the campsite by 4:30 so we can start cooking dinner by 7. 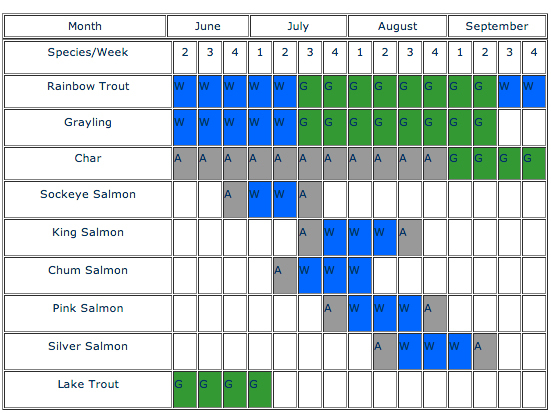 With everyone helping we can take more time on the river with you at the best fishing spots. There is so much fishing daylight the camp chores are just a small part of the day. 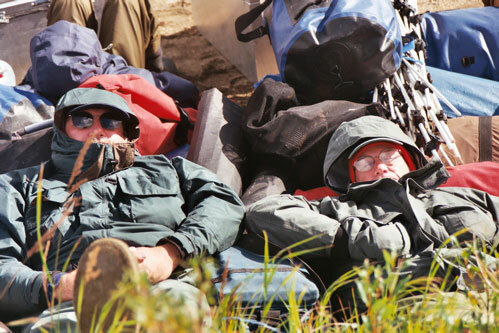 The other benefit is the work tends to eliminate folks that just shouldn’t be out on a camping trip anyway and we get groups that are like minded campers and fly fishers. On a float trip you determine when to stop fishing not the lodge. The majority of the fishing is done while wading but we always fish from the boat as well. Some days we will spend an hour in the boat other days 3-4 hours but it is always broken up by periods of wading. 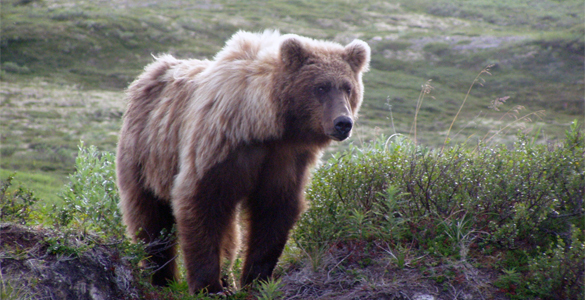 We will be living in one of the densest populations of brown bears in the world. 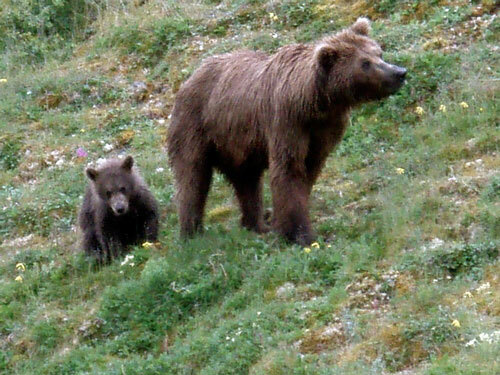 These are coastal browns which enjoy a much safer reputation than the interior browns (called grizzlies when they are 50 miles from the ocean). 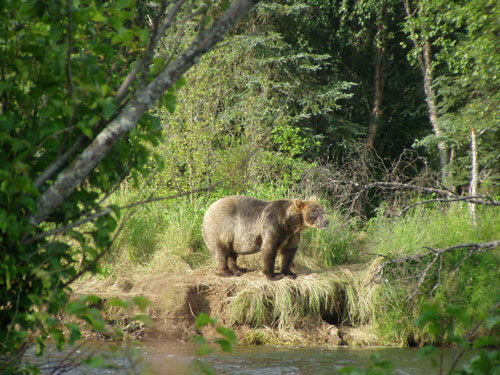 These bears are very well fed on the salmon running in the river. 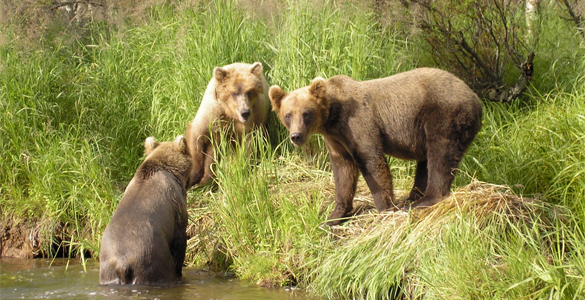 The bears like to follow the sockeye salmon so if you are visiting a river during the sockeye run you will encounter many bears on a trip. 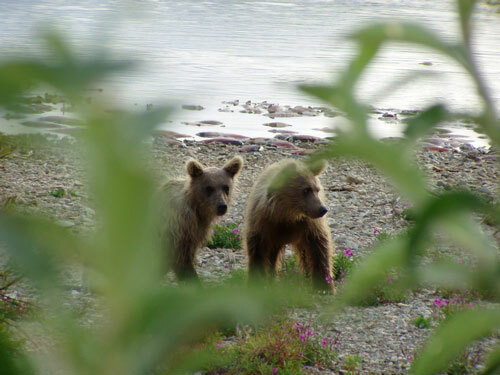 Although there has never been a physical incident in Katmai National Park we follow all the “bear-safe” precautions to make sure our journey is safe. 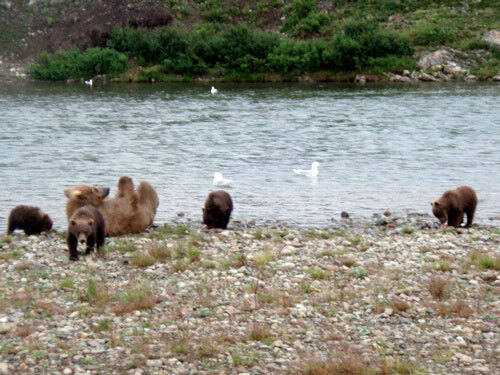 The bears are so well fed that they will avoid us as long as we don’t interfere with their ability to fish. 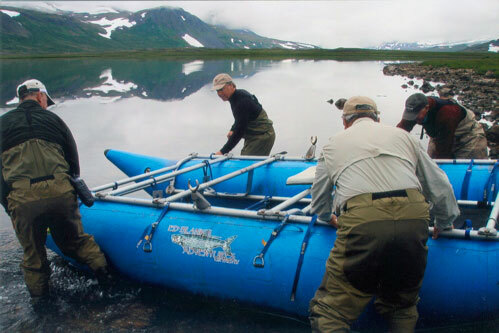 The week seems to fly by and before you know it we are dismantling the rafts, and loading the plane for the journey back to King Salmon. 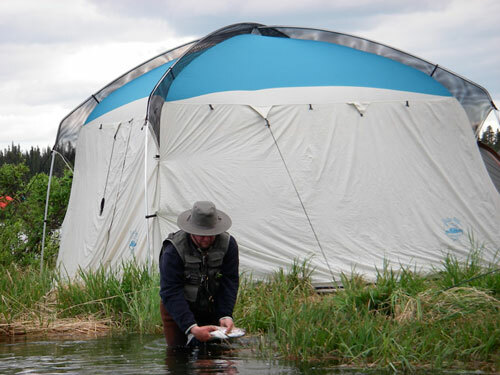 Living in the wilds of Alaska with no civilization to be found is an experience in itself, combine that with some of the finest fly fishing in the world and it becomes an adventure you will never forget. 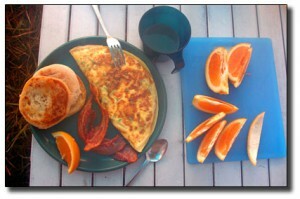 Most special dietary needs can be accommodated. Dinner: Mesquite grilled Pork Tenderloin or fresh salmon or char – porcini risotto -peas, smores for desert! 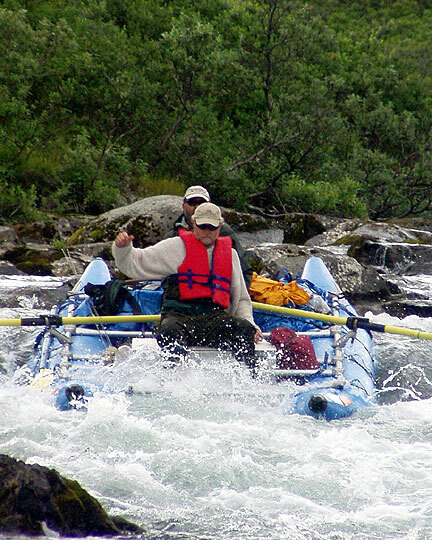 Hi, I’m Ed Blank and I have floated Alasak rivers fro over 20 years, it is hard to believe it has been that long! All the trips have several things in common: first: their clearwater, second: they are only accessible by floatplane, and finally: the quality, variety and quantity of the fish. All the rivers we float are clearwater streams with no glacial silt. They all flow out of lakes which serve as volume controls and filters. 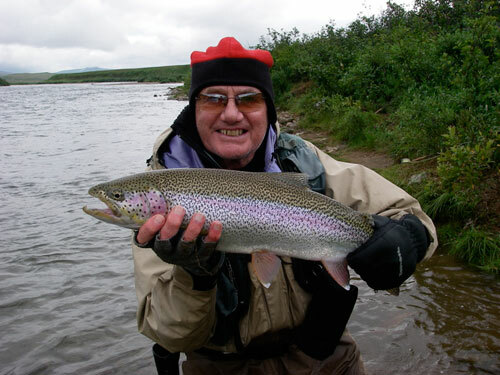 So many gorgeous rivers in Alaska are dependent on the weather for prime fishing. is the water too high? too low? too much silt? 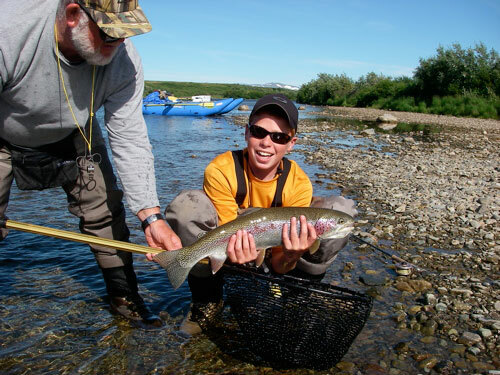 Located in Southwest Alaska at the foot of the mountains these rivers are consistently clear all summer long. I guarantee you won’t hear me say “Well, the river is a little cloudy this week but….” . Since you will be scheduling your trip far in advance the consistency of the river is of prime importance to both of us. We are also offering trips on a limited basis to the Goodnews river valley – we have experimented with the area and are preparing some prices for this unique watershed. It is a little further still from civilization and hence a little more expensive. 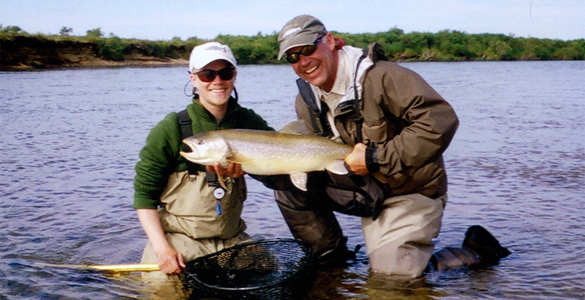 Read more about the different rivers that our guides and outfitters call home. 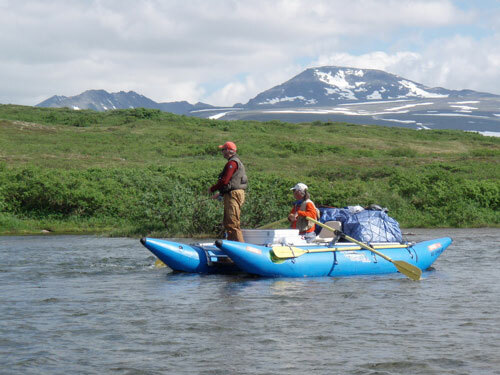 We float about 36 miles of the Alagnak from its headwaters to the end of the “Braids”. The river is about 60 feet wide at the top and meanders through riffle after riffle, run after run over a beautiful gravel bottom. It is this gravel bottom that makes the Alagnak so desirable as salmon spawning grounds and it’s the salmon that gives the nourishment needed to support it’s incredible rainbow trout fishery. As the rivers joins with its sister branch the Alagnak seems big and unruly but it breaks up into very fishable channels and runs. This dividing continues until we reach the “braids”. The ” braids”is a delta like section of the river full of of small streams that join and split for miles. It would take months to fish this area thoroughly. Many of these channels are barely big enough for our raft, but the fish just seen to get bigger and bigger!! The bottom half of the river flows flows through lowland tundra with alder and spruce lined banks.Silver Salmon caught on a fall float trip on the AlagnakThe fish in this river are spectacular every week of the season. 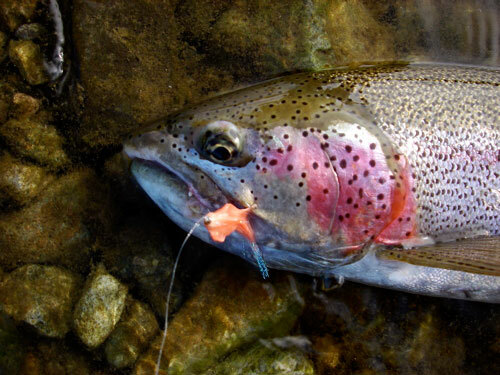 If you have your heart set on one particular species I can pinpoint a successful week but if you don’t care if you’re catching Rainbows, Kings or Silvers, any day of the season has spectacular fishing. Every day and every stretch of water holds something new. The Rainbows are the mainstay of any trip, they range from 10-30″ with most fish in the 15-24″ range. The fight in this strain of rainbow is amazing. Every year when I hook that first bow I can’t help but yell with excitement as it cartwheels all over the river and slips the hook! 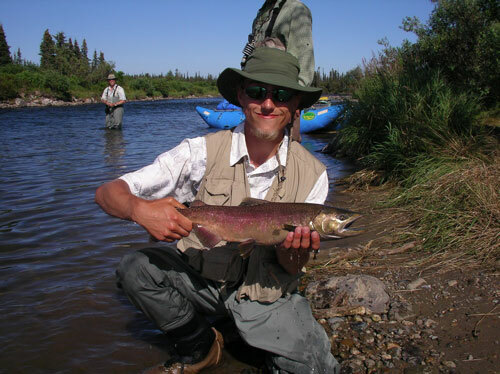 The Alagnak is a great river to flyfish for King SalmonThe Salmon runs on the Alagnak ak are famous. The Kings range from 25-60 lb., Sockeyes are in the 6-15 lb. range, Pinks 3-8 lb., Chums 8-20 lb. and Silvers 10-20 lb. 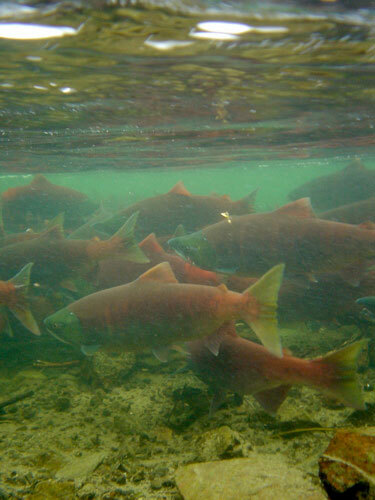 All toll there are between 2 and 4 million salmon that spawn in this river every year! Grayling and Char are an added bonus all season with a few lake trout thrown in! 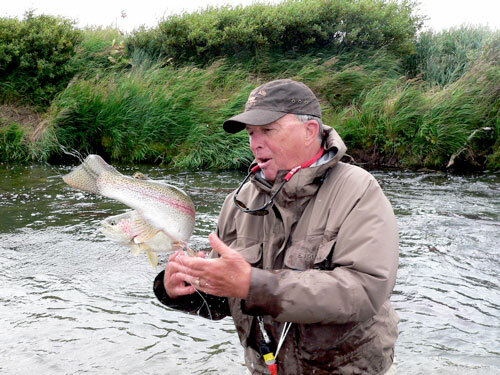 The river starts to piece itself back together, and gets deep not as friendly to fly fishing. 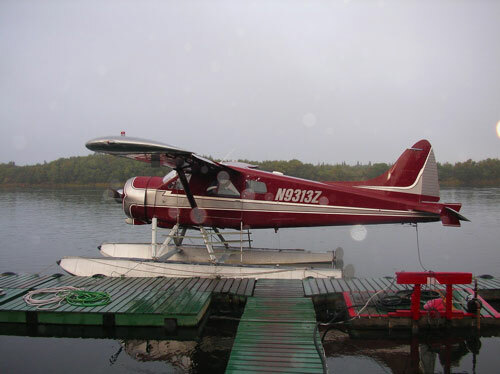 We meet our float plane at the first landing area available 10 miles upriver from the lodges on the lower Alagnak. 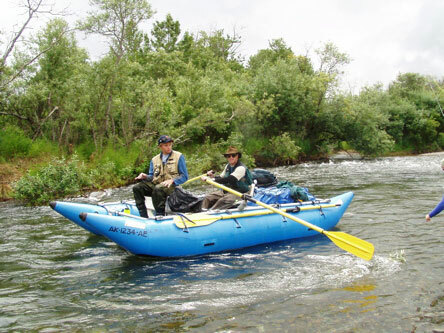 A float on the Alagnak takes you through the prime flyfishing areas that are accessible only by raft. The beauty of Grizzly Creek is astounding. 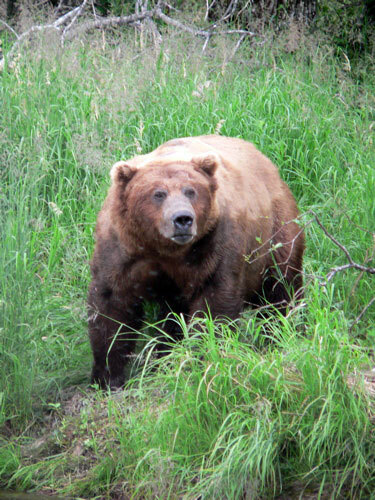 If you want to key in on large rainbows and char, you want to be alone, see lots of bears, and you don’t mind hard work, the Grizz is for you! 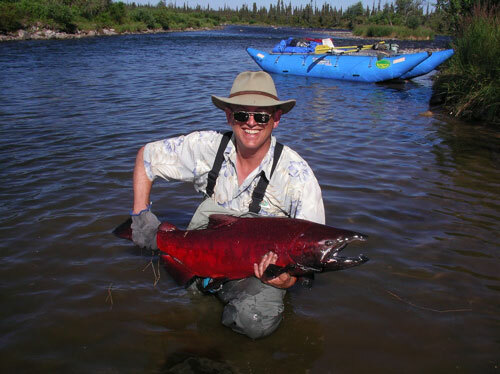 The sockeye salmon do not spawn in the main rivers like the Alagnak or the Naknek Rivers. They swim through the main drainage into smaller tributaries like this one to spawn. The bigger trout from the main river and lakes will follow the sockeyes knowing what to expect (huge numbers of tasty, calorie filled eggs!) The river starts in Alpine tundra, winds through a beautiful rock wall gorge and runs through a lush forest valley to the lake.It is the most scenic of the 3 rivers. 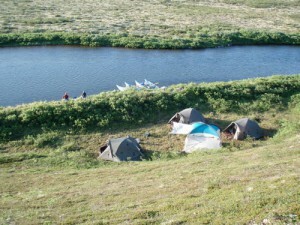 Occasionally a plane from a lodge will land at the small lake at the top but there is no other access until we reach the bottom. The other thing that keeps people out is that the river braids up at the bottom with twists turns and downed trees that make it impossible for a jet boat to get by. This means large trout and char all 18-30 inches (3-12 lb.) that may never have seen a human before. The problem is this: you will have to work your tail off to navigate this stream. The rafts will hang up on rock after rock until you ache from jumping out pulling it free and jumping back in again. 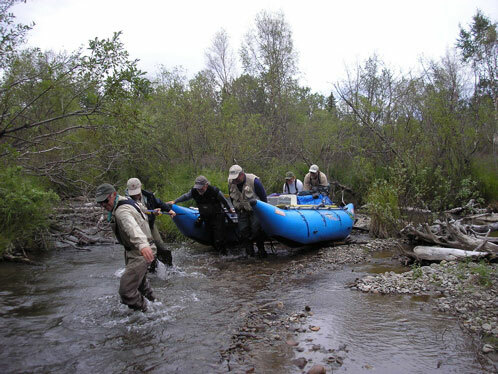 At the bottom we might have to lift and push the entire raft over a tree that has fallen across the river or drag the raft across a gravel bar to avoid a clogged tree strewn corner in the stream. Only those that are in good physical condition should attempt this trip! The other plus (or minus depending on your tolerance) is the bears. They follow the sockeyes to! 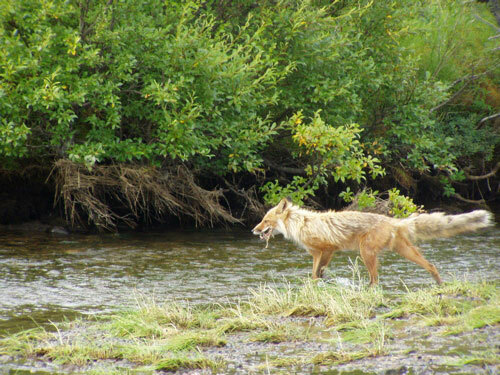 A smaller stream means closer encounters but they are so fixated on the bright red salmon that they let us be. 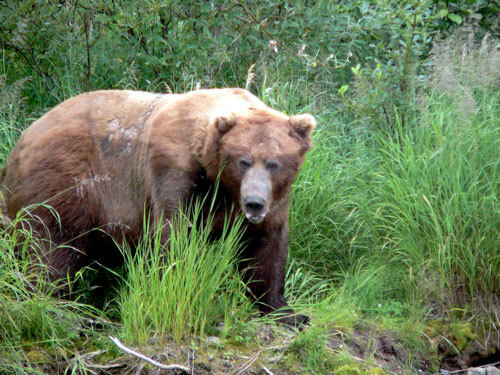 August and the first part of September are the prime season for Grizzly Creek. The Moraine is famous for good reason. Like Grizzly Creek there are large trout that are there for one reason: sockeye eggs! This stream always produces the largest rainbows of the year. The only drawback is that flyout lodges bring clients here every day as there are a couple of lakes where they can land that are a short hike to the river. We will see people on this trip but we will have the advantage of being on the river all day and float some areas that are inaccessible by plane. The terrain is alpine tundra. We do a lot of sight fishing to very large shadows here. 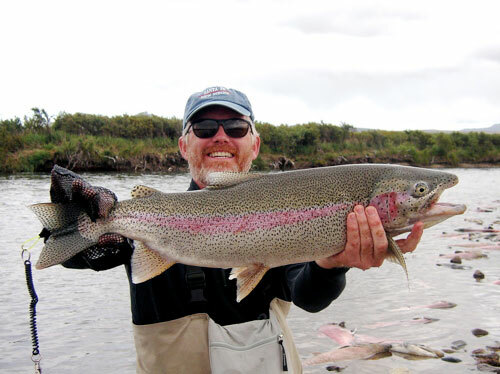 Not as many fish as on Grizzly Creek but the size is large with most fish in the 25-30″range. A good day can be 25 hookups and a poor day is just a couple hookups. The fish are so large and fast, the landing percentage is very dependent on how good the angler is. 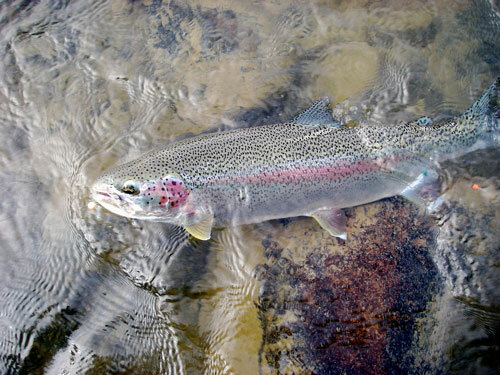 These fish are the size of steelhead and they have the same attitude as steelhead – run fast and jump! The float is quite a bit less demanding than Grizzly Creek as well. 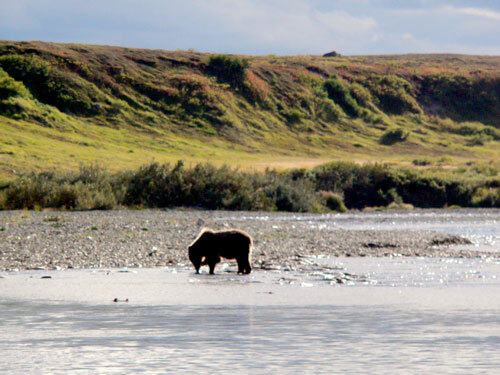 There are lots of bears feasting on the salmon run with plenty of opportunities for some photos. 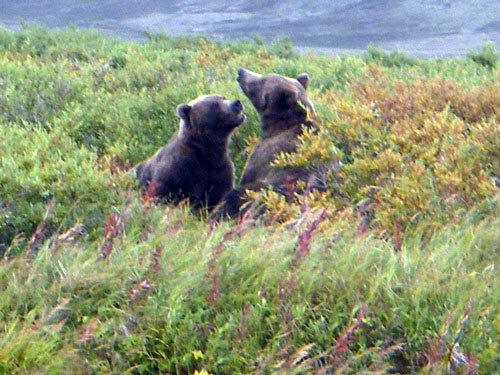 It is worth the price of admission for the bear viewing alone. 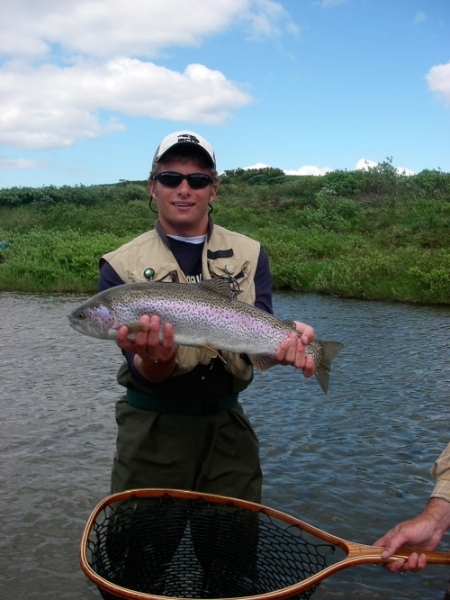 We can guarantee a ten pound trout on this trip, it is an amazing trout stream. 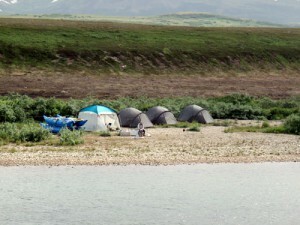 We also combine a 3 day float on the Moraine and a 4 day float on the Alagnak for some added variety and excitement. The Moraine fishes well from late July to early September. 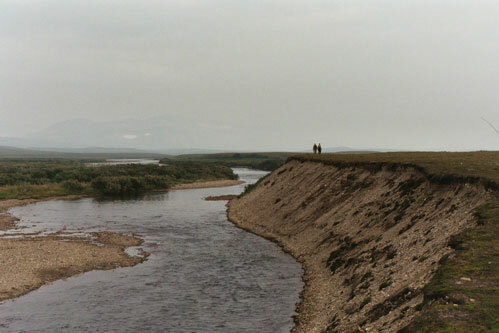 The Goodnews River is located in southwestern Alaska, and flows out of the Ahklun mountains some fifty five miles from where it empties into Kuskokwim Bay near the Alaska Native villages of Goodnews Bay and Platinum. The Goodnews River actually consists of several forks, the South, Middle and North forks, the latter two offering access for our float trips and can be considered as different waters as they join up within a just few miles of the ocean. 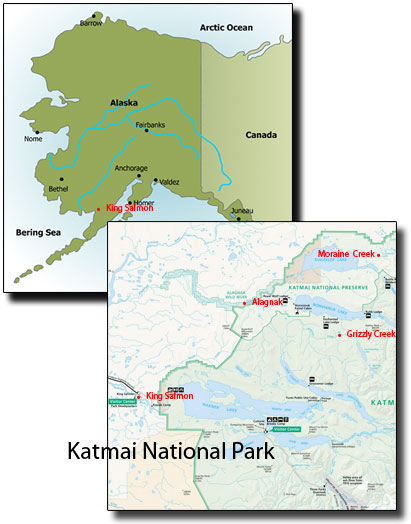 The upper portion is within the Togiak Refuge Wilderness area and the U.S. 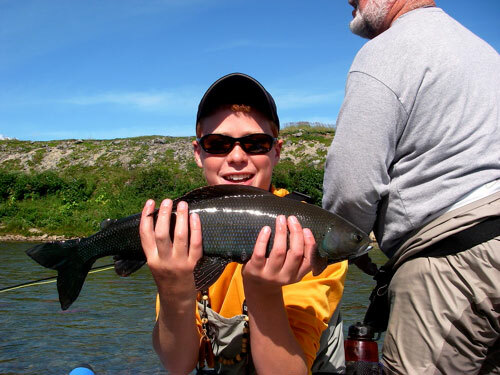 Fish & Wildlife Service regulates commercial float trips on the river and the special use permit awarded to Alaska Rainbow Adventures allow us to offer you float trips during the prime fishing dates for a Goodnews river float fishing trip. Rising on the western slopes of the Wood River Mountains, the Togiak drains the southeastern quadrant of the Togiak National Wildlife Refuge. With 4.2 million acres, the refuge is about the same size as Connecticut and Rhode Island combined. 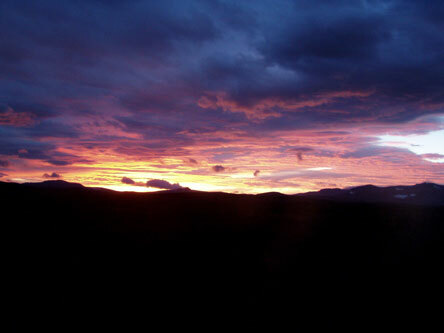 It is a wilderness area of craggy mountains, broad river valleys and wildlife. While it is easy to be distracted by the scenery, try not to do so when your drag’s screaming, your rod’s bent to the breaking point and you are rapidly running out of line. 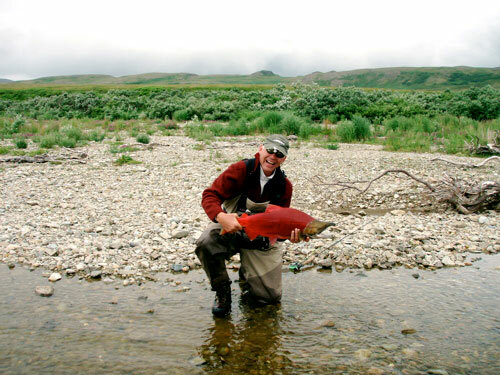 That’s king salmon fishing and just one of the reasons the Togiak is one of our favorite Alaskan wilderness rivers! 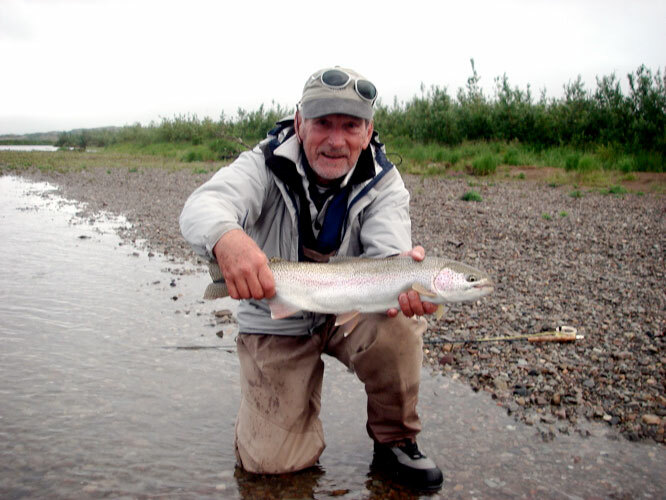 The Togiak river is also noted as being arguably the best river in Alaska for it’s spectacular silver salmon angling with some of the largest coho’s you will find on a floatable river in Alaska as well as the most consistent returns as far as run strength. 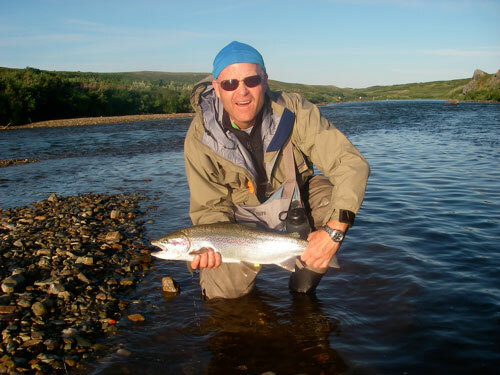 You will also find available are ‘large’ resident rainbow trout, arctic char, dolly varden and grayling all while you are surrounded by some of the most beautiful country in Southwest Alaska. 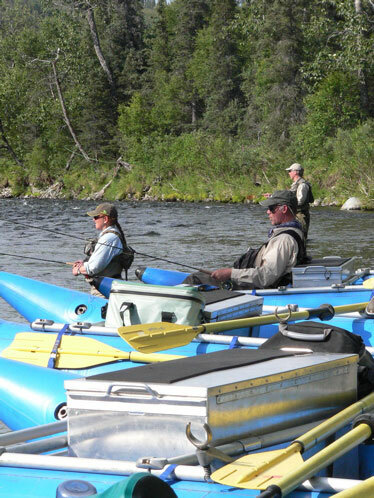 Come experience Alaska’s Togiak River and the camaraderie of a wilderness Alaska fishing float trip that is second to none. We operate some of our fishing expeditions on the rivers in Western Alaska out of Dillingham and Bethel. 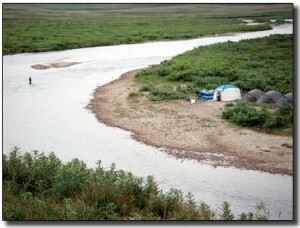 The Kanecktok River is in Togiak national Wildlife Refuge. The Kanektok flows as a clear water river with prolific bird life. It is often referred to as the “Chosen River” because if there is a river in Heaven this might be the one. 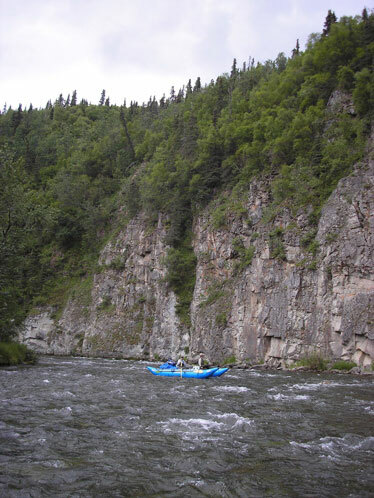 Fishing in Alaska doesn’t get much better than on the Kanektok, which flows through the beautiful Ahklum Mountains during its upper half. We begin our journey with a float plane trip to the headwaters where we land in Kagati Lake. 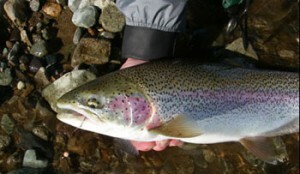 It has strong runs of all the Pacific salmon, especially Kings, Silvers, sea run Char and Rainbow. 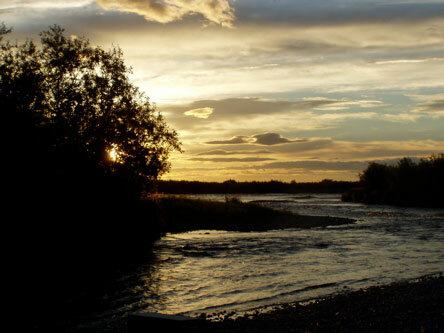 The second half of the river flows onto the coastal plain through willow, alder and cottonwood forests. The Kanektok truly fulfills the dream of Alaska’s best fishing river. At our trips end you are two miles from the ocean; which ensures a mighty fight from the Salmon. The river then pours into the Pacific at Quinhagak, our take out point. Here is a list of the basics you will need for your trip. Many of our destinations are pretty remote with no chance to buy things on site. #2 Streamer line with 10 -15 foot sink tip (Type 6 fast sink) Floating setup needs 9 foot leaders ending in 10-15 pound tippet. 9 foot leaders ending in 8-12 pound tippet. #2 Streamer line with 10 -15 foot sink tip (Type 6 fast sink) Floating setup needs 9 foot leaders ending in 12-15 pound tippet. 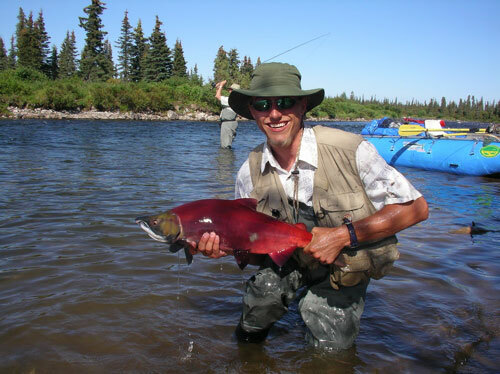 Prices include: round trip float plane flights from King Salmon oe Dillingham to the river, camp lodging, three meals a day, guided fishing each day, it includes soft drink, taxes. Prices quoted are per person and in US dollars. Most people recognize the advantage of our unbiased advice, there are hundreds of destinations to choose from and our job is to know the ones that are right for your needs. We offer the real story you can't get from a lodge owner. Would the outfitter in questions tell you are booking in a less than stellar part of the year? Remember our unbiased advice is 100% free! Our website highlights many of our favorite destinations but we have access to hundreds more. If there are fish there, we can book it. In fact, we will give you 5% back if you book a trip through us that is not on our website! We enjoy learning about new spots! 2017 Special: You are automatically enrolled in our loyalty program before your first trip and will get the 5% cash back on your very first trip. This offer is good until December 31, 2017. In January you will ear your loyalty discount on the second trip and every trip thereafter. This discount applies to all your friends who are going with you as well. f you organize a group of 8 or more we will give you 10% off! 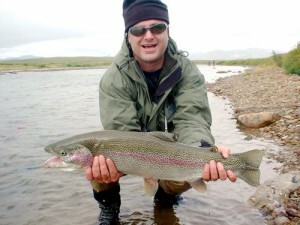 All you have to do is book the first trip and you are a flyfishingheaven.com frequent fisher! If you find a price lower than ours we will beat that price by 5% if you book through flyfishingheaven.com! We promise to work for you, not a lodge, outfitter or resort. We pledge to get you you to a destination that will live up to your expectations at the best possible price. You will never be charged more than booking directly (in fact most of our clients are paying less - *see below). 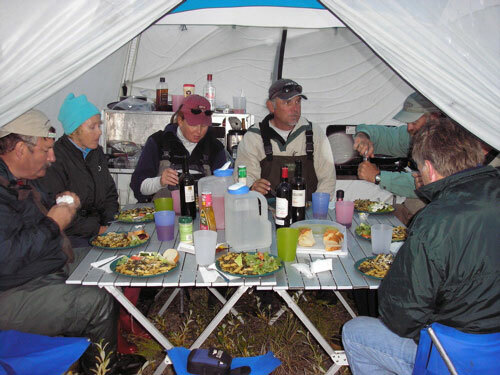 We will make sure you are well prepared for your trip with specific knowledge about the gear, the flies, the rods, packing lists, travel documents, connecting information everything. Since we are not tied to a particular destination we promise honest pros and cons of any destination at the time of year you are traveling. 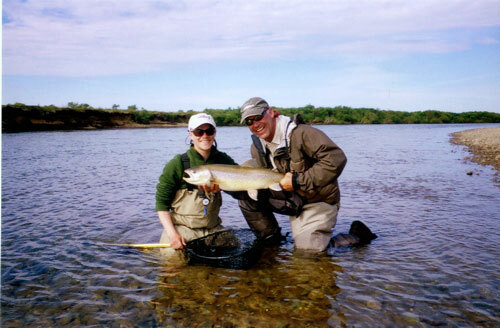 We do earn a small commission when we book a trip as all lodges and outfitters offer this as they depend on agencies like ours for much of their business. This fee is paid by the lodge not you, and they do not keep different prices for direct bookings vs agency bookings, it is bad business. A 10% deposit is required if you are booking more than 6 months in advance, 50% deposit is required when less than 6 months until departure date with the balance due 60 days prior to departure. If you are forced to cancel with more than 60 days notice, you may keep full credit towards another trip or receive a refund less a 10% service charge. Deposits on cancellations with less than 60 days notice are not refundable unless your spot can be filled. MC, Visa, and checks are accepted. We recommend travel and or medical emergency insurance for all our trips. Please take a look at the photo and video galleries related to Campeche Tarpon. You will ned to fly on a commercial airline from Anchorage to either King Salmon, Dillingham, or Bethel depending on which river trip you are doing. 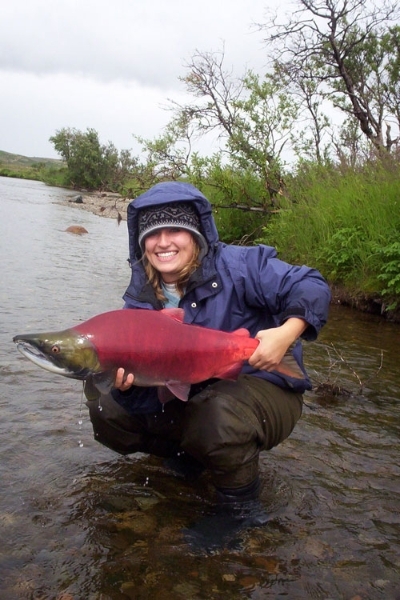 Our home base is King Salmon Alaska which is in the heart of the Bristol Bay Drainage. 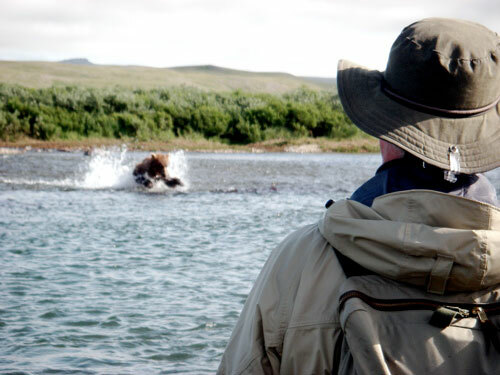 Katmai National Park is where we do most of our fishing. 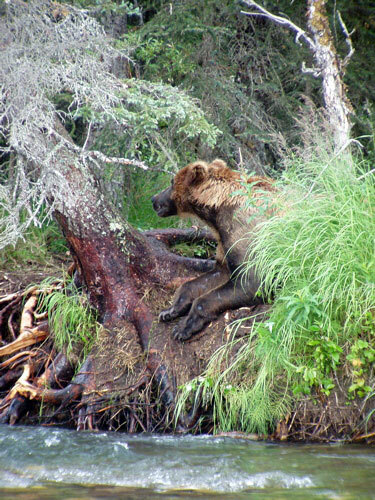 It is about 300miles South west of Anchorage. The only way to get to this area is to fly into King Salmon. There are several flights a day from Anchorage to King Salmon on several commercial airlines. Why go this far? The further away from Anchorage you go the better the fishing will be. ( although you will not find rainbows if you go north and too far west!) There are some very nice scenic float trips that start near Anchorage ( like the Talichulitna) that eliminate the need for the extra flight to King Salmon, but the number of people quadruple for that reason as well. Did you know they allow helicopter fishing in that area? During the day every hole will have fishermen in it. 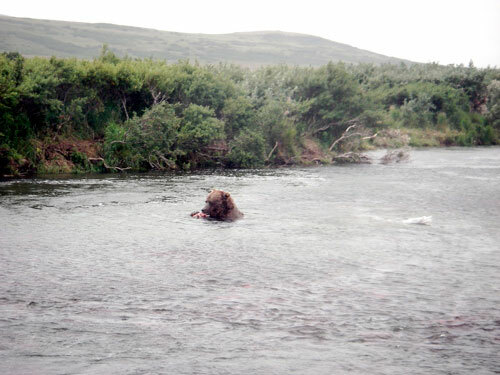 Not in Katmai, and our rafts can get to places float planes can’t! Fly fishing was the only option when I was a kid - I grew up on a fly fishing only river in Northern New Hampshire. Not much to do there but fish in the summer and ski in the winter so I learned to do both very well. 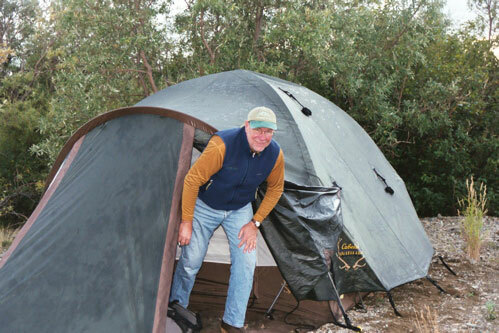 My fishing career began in Alaska outfitting and guiding float trips for 18 years. Looking for something to do in the winter I got together with many of my Alaska clients and we traveled the fishing world, which has now turned into flyfishingheaven.com. Travel advice for like minded fly fisher men and women. I love it! I currently work as a tarpon guide in the Florida Keys and I was lucky enough to have spent years as fishing director and General Manager at El Pescador in Belize. If fishing is a religion, fly fishing is high church. Fly Fishing Heaven, BFSC Inc. © 2017. All Rights Reserved.